The visible signs of the Colorado winter are gradually etching the landscape. The leaves with their red and gold hues are all but gone; not even to be found delicately, crunching underfoot. The pleasantly sunny and temperate days, and the cool evenings of late paint a perfect fall picture. The Colorado fields; resting, rejuvenating and replenishing for the next season, relate a winter story, however. The other day, while on my way to lunch with Ansh (from Spiceroots), I was stopped at a traffic light. As my thoughts meandered west, my eyes fell on a tree growing by the foot path. It stood tall and bare, symmetrical in its shape and the spread of its branches, and unashamedly proud of its naked glory. Through its graceful, bare branches I espied the Rockies, grand, majestic and beautifully snow capped, towering over Colorado. The signs of winter are here, but autumn doesn’t want to relinquish hold. That’s fine by me, running errands in a sweater and jeans, instead of snow boots and woolly hats, is all right with me. The beauty of Colorado in winter is just as grand as the first springtime buds, flowering glory of summer, or the colour of autumn. The reds and golds may disappear but the evergreens dot our landscape, parks and neighbourhoods. The scenery may be bare but the fragrance of pine and fir is strong and heavy, and welcome as it permeates the frosty air. There is nothing more heady than the scent of pine mixed with the cold. I take deep breaths to inhale that fragrance when we hike through the mountains on a cold autumn day. The smoky smells of a crackling, wood fire rising through the chimney, a bubbling stew on the stove and holiday baking are all smells of winter comforts. The sounds of giggling children on skates and the surprisingly, soothing sound of metal slicing through ice, the holiday Muzak mumbling in the background, and that of friendship and family are all familiar, comforting winter sounds. Colorado’s growing season may be over, and winter is rearing its frosty head, but we can still enjoy a little bit of autumn in the beautiful weather we are experiencing, in the abundance of squash, the seasonal cauliflower, which is quite vibrant and adds so much colour to the plate and the plentiful, root vegetables. This beautiful cauliflower I sliced into steaks and roasted, came from my faithful, local farm, Isabelle Farm. I made this a few weeks back and this head of cauliflower was as vibrant as any bouquet of flowers. In fact, when I purchased this, I carried it out from the farm stand as a bouquet, it was just too pretty to bag. Beautiful and all, but how did it taste? Amazing, I think cauliflower is amazing, not only in its beauty but in its simplicity. It just needs to be roasted (or fried) and a sprinkle of salt, a squeeze of lemon, or maybe a drizzle of tahini is all it ever needs. Here, the cauliflower steaks were roasted, and then a garlic, rosemary browned butter was liberally poured over. Oh my goodness. Of course, you don’t need to cut them into steaks, you can use the florets or even roast a whole cauliflower. Just don’t forget the brown butter. The Roasted Cauliflower with Brown Butter is a great side dish for roasted meats and your holiday table. It’s also a great dish for vegetarians tossed with some pasta and Parmesan cheese. 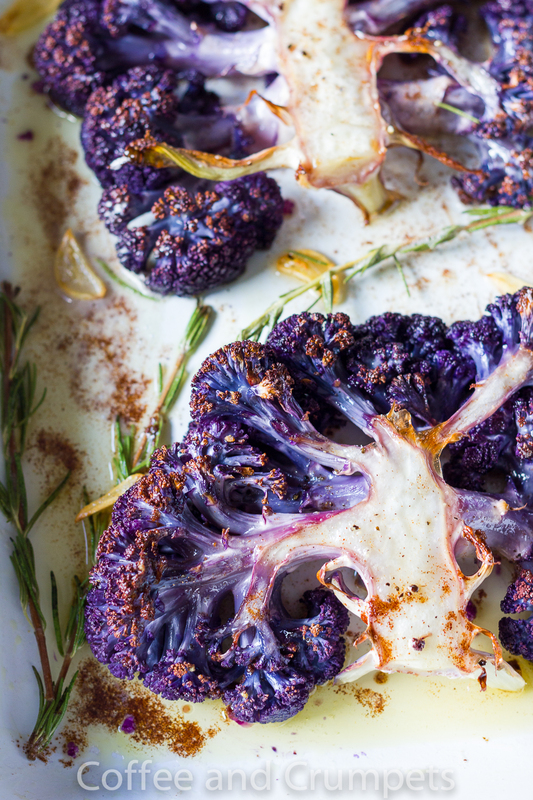 Beautiful purple cauliflower roasted and drizzled with garlic rosemary brown butter. Cut the cauliflower into steaks about a ½ inch/1½ cm thick. The cauliflower might crumble if it's not firm, or the florets are not tight. Try and get as many steaks as you can. Roast the ones that fell apart alongside. I was only able to get three out of mine! Toss with the olive oil and place in the oven to roast. The cauliflower will take between 20-30 minutes. I like mine a little crispy around the edges so after 20 minutes I keep an eye on it. Sometimes it takes about 40 minutes to get it nice and brown. While the cauliflower is roasting, make the browned butter. In a small pan, melt the butter on low heat. Allow the butter to start getting bubbly, and foaming subside. Add the sliced garlic and rosemary spears. Continue to watch the butter, and went it starts turning colour, watch it very carefully because it will burn very quickly. You want the milk solids to turn a rich golden colour, almost brown. It will take between 4-6 minutes to brown butter. Remove from the heat and keep aside. Once the cauliflower is done, remove from the oven and place onto a serving platter. Scatter the florets around as well. Pour the browned butter over the cauliflower and add the garlic slices and fried rosemary to the platter as well. Serve as a side to meats or as a vegetarian dish tossed with pasta. I hope you’re all having a great week so far. I hope it hasn’t been too hectic, I am thoroughly enjoying all the holiday posts and the cookie and cake features. Since we don’t celebrate Christmas, I hardly ever bake holiday cookies, but seeing all the pretty shapes and sizes makes me want to go out and buy holiday cutters and start baking! Having said that, I am doing some holiday cookies for clients but they’re your run of the mill cookies, not intricately decorated gingerbread men or sugar cookies. So, I’m with you all in spirit! Have a great rest of the week, dear friends! That colour looks absolutely gorgeous Nazneen, and genuinely, it looks very tasty, but I’m sorry – I can’t get past the fact that it’s “still” cauliflower, and the only way that is finding it’s way into my belly is if it’s raw (when it’s delicious), but beautiful post nevertheless! Beautiful and ever so scrumptious looking! A wonderful idea. What a gorgeous head of cauliflower! 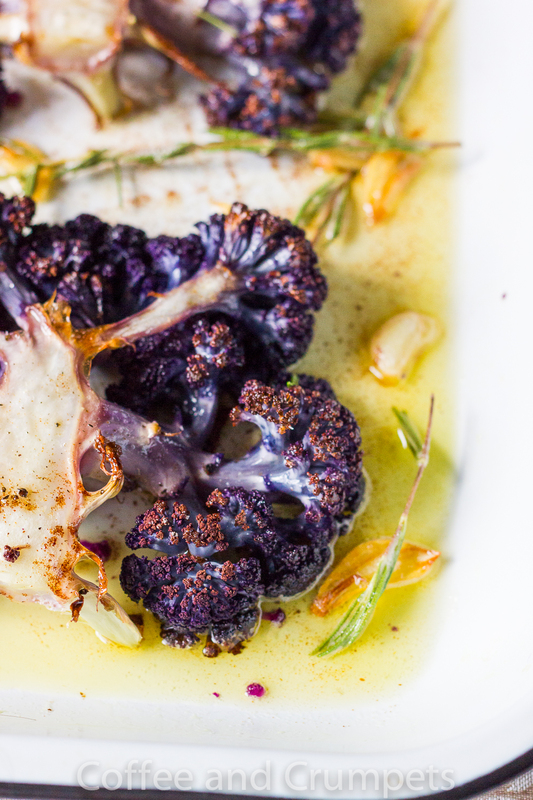 This reminds me when I roasted cauliflower with brown butter and capers… Yummy! That’s a gorgeous cauliflower! I love roast cauliflower — and it’s one of those dishes that even people who don’t “like” cauliflower, well, like. Rarely serve it with browned butter, though — I really should. Great idea! Nazneen – you paint such gorgeous pictures with your words in this post as well as in this artistic and colorful roasted cauliflower dish! 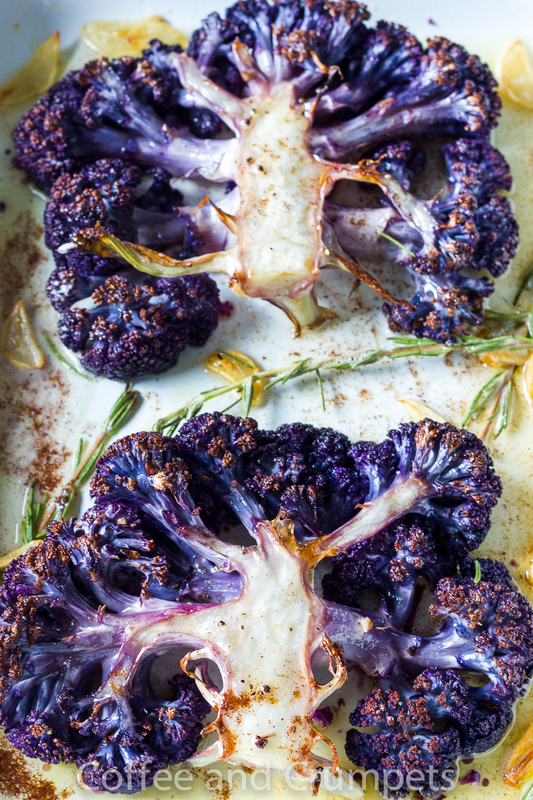 Awesome choice to use purple cauliflower in this! Wow! Simply Stunning! 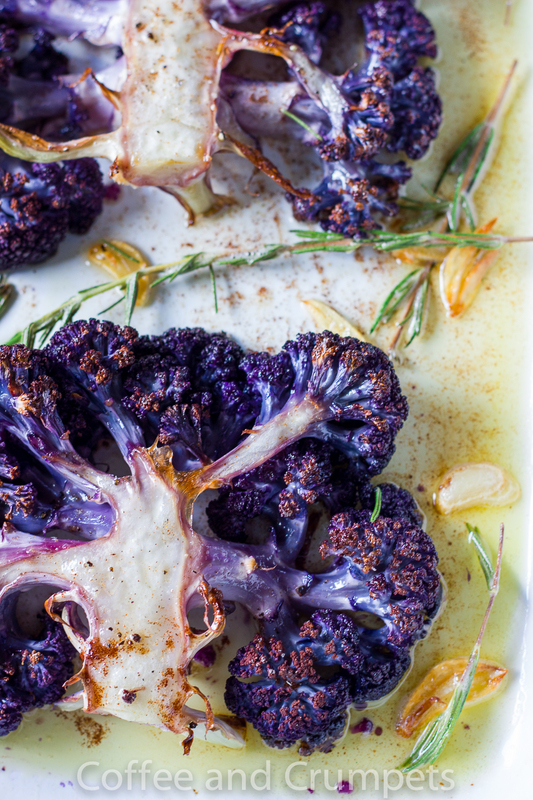 Yum, I love roasted cauliflower and that color is just gorgeous! I am a HUGE HUGE fan of cauliflowers…the purple cauliflowers are just stunning! Aren’t they just beautiful? Thanks Angie! The new look of your blog is FABULOUS. Loving everything about it…each and every small detail. As for this roasted cauliflower, it not just looks pretty but sounds wonderful too. The garlic and rosemary combination must have been so good to taste. I am going to try this very soon. Thank you so much Taruna, I appreciate your comment!! I’m glad you like it. It was time for a change. I hope you do try this, it’s SO good! We have had snow on the ground for a while and winter seems to be in full swing. I love your beautiful cauliflower…hopefully our market will bring in some of the purple ones. We thought we’d started winter too, a couple of weeks ago when the temps dipped and it was snowing and downright freezing! But then, the temps went up and it’s been very nice the last week or so. All the leaves are gone as is the produce but the weather is great!! I’ve seen this color in Sprouts market and an orange one which looked so lovely. I was afraid though to buy them thinking they might taste awkward !!! How wrong was I?!!! I love Colorado in Fall but WInter is a no no for me. I love seeing snow capped mountains but do not like seeing snow on the streets :). Thanks for the wonderful yet simple recipe. Most of the time, vegetables or fruit that are just different in colour, never taste any different from the original. Same goes for the purple green beams or the red okra, all tats like regular green beans and green okra. It’s just the colour and probably higher vitamins because of the coloration. Try them, they are great! I like the purple glow though 🙂 Such a beautiful colour on this cauliflower. Hi Nazneen – the new look/design of your site looks great! Your words made me want to visit Colorado…hope you enjoy the relatively warm days and have a lovely winter season too. This roasted cauliflower looks so wonderful. I steam mine all the time and need to shake it up. That color on it is beautiful as well. Thank you Monica!! Colorado in winter is just magical, and it’s pretty nice in all the other seasons too. I’m very blessed to live here. Love the color of this cauliflower… and yes, I would devour this on a sec all by myself. What a clean, new design your blog has!!! Thank you, my friend! I agree, the colour is just gorgeous! Hi Nazneen, cauliflower is one of my favorite veggies roasted, will have to try this purple variety, looks delicious! You must Cheri, it is delicious and beautiful to look at! Love roasted cauliflower. I will have to try rosemary butter over top, that just would be heavenly. Hugs! Thanks Mariyam, the butter was pretty awesome 🙂 Hope you are well!! See you soon? I agree, any cauliflower will work but the purple one was too pretty not to buy! Mmmm, this looks just wonderful. These photos will definitely have me running to the grocery store later on today. Your story will have me gazing out my front window for a view of the mountains. One reason we decided to redo this old house was because of its million dollar view. We count ourselves lucky every day that this is where we live. Ooooh, your house sounds amazing, I’m going to have to check out your view one day once you’re all settled in. I hear about the beauty of the Colorado mountains over and over again from my brother and sis-in-law. Hopefully one day I will see it. Cauliflower is such a lovely vegetable..it is always delicious whichever way it is cooked. But I agree it’s beauty lies its simplicity. And when it’s crisp and brown it tastes the best. I love how you have captured it’s vibrant colour and natural beauty. Thanks Sonali! I love cauliflower any way, but my favourite is this way, simply roasted. Thanks!